I love trail mix! The picture here is not a picture of the recipe I'm providing here today, but it looks good to me all the same. Personally, it's not trail mix to me without raisins and maybe another dried fruit or two; however, I seem to be in the minority. That's ok; that means I get all the dried fruit when I hike with anyone in my family or with my hiking buddy Kim. 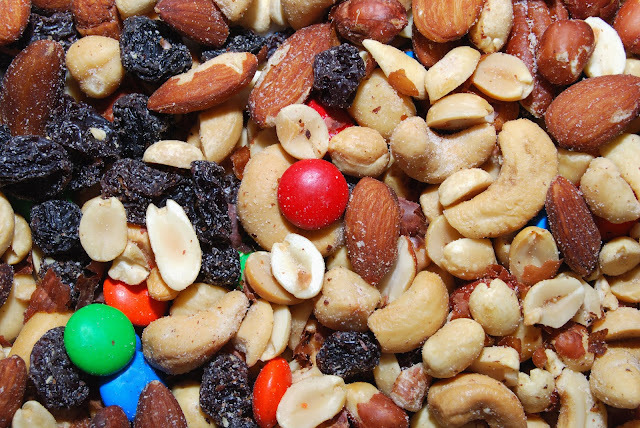 Here's my favorite recipe for trail mix. It requires a little stove top action and oven time, but don't let that scare you away. It's well worth the effort. I like to make it with seasonal M&Ms - pastels at Easter, patriotic colors at Independence Day, Fall colors in the Autumn, etc. In a large pot over low heat, melt butter; add honey until blended. Remove from heat & add cereal, nuts, pretzels, granola, and raisins, stirring until all pieces are evenly coated. Spread mixture onto cookie sheet & bake at 300 degrees for about 10 minutes (do not over bake!). Spread baked mixture onto waxed paper & allow to cool completely. Pour into large bowl and mix in your favorite M&Ms variety (I prefer plain milk chocolate). Store in tightly covered container or large ziploc bags. Makes about 7 cups. Tell me what you like in your trail mix. I'd love to know if you're a nutty person, a fruity gal or guy like me, or just crave (and hog) the chocolate.